In this section, we will describe how to start your robot and give an overview of the possibilities to access it. Poppy creatures come with an embedded board which job is to control motors and access the sensors. For simplicity purpose, this computer can be remotely access through a web interface. 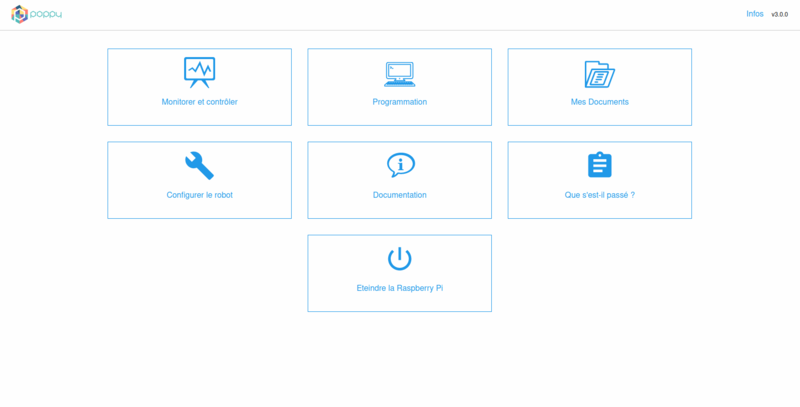 It makes it easy to control the robot from your own computer or tablet without having to download/install anything. If you are planning to use a simulated robot, you must install the software on your personal computer. Follow the instructions for setting up the simulation. The easiest and quickest way - by far - is to use an already made system image for a SD-card. ISO images come with everything pre-installed for your Poppy robot. It is also a good way to ensure that you are using exactly the same software as we are. Thus, you will avoid most problems. Poppy robotic kits come with a ready to use SD-card. So, you do not have anything special to do. They can be written to a SD-card (at least 8 Go) by using classical utility tools. Once the SD-card is ready, just insert it into the board. Then when you switch on your robot it should automatically start and you should be able to connect to its web interface. More details can be found in the startup section. or simply if you like to understand how it works. We try to keep this installation procedure as generic as possible. Yet, some details may vary depending on your operating system or your computer. Moreover, the installation from scratch required some good knowledge of how to install and setup a python environment. Depending on what you want to do all steps are not necessary required. 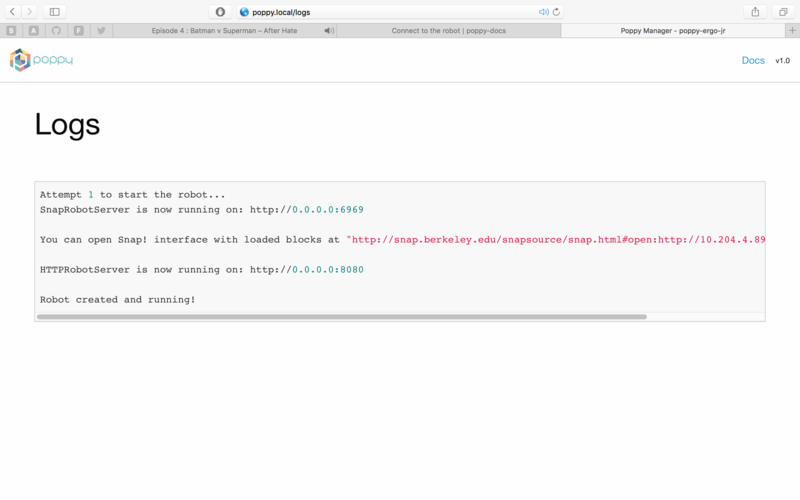 In particular, if you want to control a simulated robot, you may just want to install the python libraries for Poppy. More details can be found in the Installation for advanced users section. Once your Poppy is assembled and its software is ready, the next step is to connect it to a network. The goal is to let you remotely access the robot from your computer or smartphone/tablet, control and program it. Connect both the robot and the computer to the same network (e.g. the box of your home or the school network). Directly connect your robot to your computer using an ethernet cable. While directly plugging the robot to a computer works for most users. It seems that in some strange cases it refuses to work. 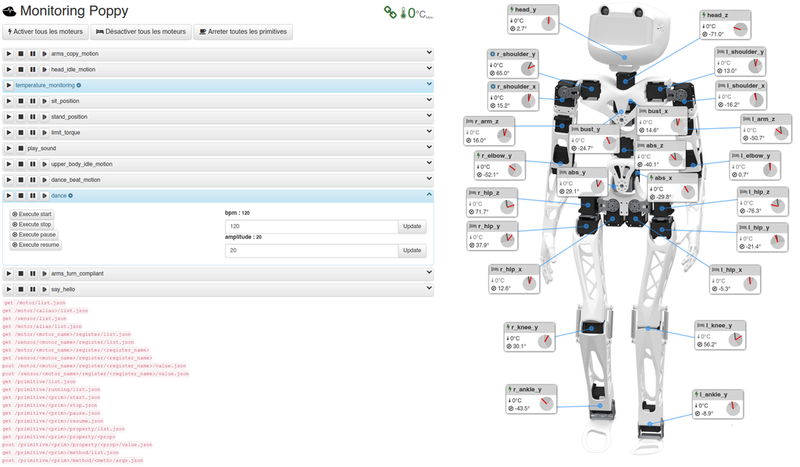 To find the address of your robot on the network, we use the standard Zeroconf protocol. It allows you to use the robot hostname: "poppy.local" as its address. This should works without any configuration under Mac OS and GNU/Linux. But it required to install Bonjour Print Services on Windows. If you prefer, you can use the IP address assigned to your robot instead. If you are not administrator of your network this can be a tricky information to find. In this case the first procedure should be preferred. To check that everything is setup correctly, you can go to the following url using your favorite web browser: http://poppy.local/. You can replace poppy.local by the IP address of your robot (something similar as http://192.168.0.42). If you are not familiar with network configuration or have no idea what the previous paragraph poorly tried to explain, you should see with the IT network engineer, how this can be done. This let you turn on/off the motors of your robot, monitor them, and start/stop behaviors.